It’s once again fight day here at LowKickMMA, and the talent on display tonight (Saturday, May 14th, 2016) will come in the form of Bellator 154. Headlining the card are King Mo and Phil Davis, but there’s a whole bunch of great fights also taking place on the rest of the main card. 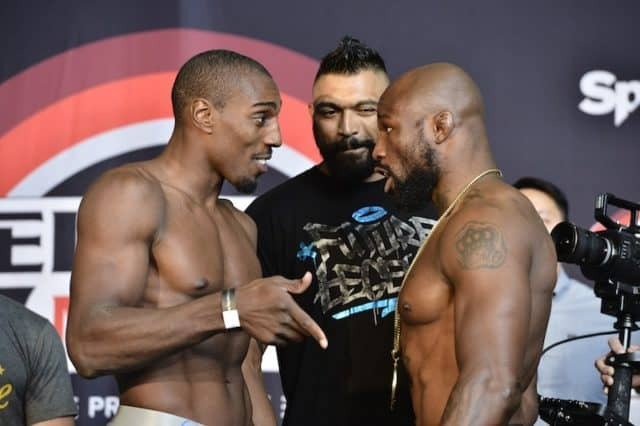 Phil Davis (15-3, 1 NC) and Muhammed “King Mo” Lawal (19-4, 1 NC) met in a light heavyweight bout in the main event of Bellator 154. In round one, there was not a ton of action. The fight stayed on the feet the entire time. In the second round, the fans were booing as there was not as much as action as they would have liked. Davis was mixing up things nicely with his strikes and kicks. King Mo was blitizing him then waiting. Davis had the range down nicely. In the third round, the two men increased how many strikes they were throwing but neither of them got the better of each other. Davis clinched and looked for a takedown but couldn’t get it. Davis stunned him then landed a huge takedown late in the round. Davis stepped over and went for an arm bar but couldn’t get it. King Mo stood up and they went back to striking to end the round. Davis earnnd the decision win. Evangelista Santos (21-16) vs. Saad Awad (18-7) met in a lightweight bout in the co-main event of Bellator 154. In round one, Santos comes out and takes him down right away. Santos went for a heel hook but Awad kicked his way out of it. Awad got on top and landed some big strikes from the top. He just beat his face in. This finished the fight. Jermeiah Labiano vs. Josh San Diego was next in a bantamweight bout. San Diego took him down in the first round and worked him over with strikes. Labiano later got to his feet and tried for his own takedown but couldn’t get it. In the second round, the two had a decent striking exchange. In the third round, Labiano got a takedown and worked him over with strikes in guard. San Diego reversed and got mount. He smashed his face in to end the round. San Diego won the fight by decision. Adam Piccolotti (8-0) vs. Ray Wood (7-2) was next in a welterweight bout at Bellator 154. In the first round, Wood landed an early head kick but Piccolotti took him down right away and landed some strikes. Piccolotti eventually got mount and locked in an arm triangle but let it go and smashed his face in from mount. He then got back mount and locked in the rear-naked choke for the win. Opening the main card for Bellator 154 on Spike TV was Andre Fialho (7-0) vs. Rick Reger (7-2) in a welterweight bout. This one did not last long at all and it wasn’t even competitive. Fialho came out and was just blasting him with strikes then dropped him and finished him on the ground to pick up the win.